Liz Walz says Genesis has been a place of hope and healing for those who have found it, and one of the goals moving forward is to increase the size of that constituency. Liz Walz had already talked about the Genesis Spiritual Life and Conference Center for some time, putting a wide array of words and phrases to use to explain its mission and methods for carrying it out, when she came upon some terminology that she thought summed it all up best. Elaborating, Walz said Genesis (that name translates to ‘new beginning’) has, as its primary mission, the goal of helping people reduce or eliminate, at least temporarily, the stress that is impacting so many lives today. And it does that by providing a place where people can focus (that’s another word she used often) and reflect, through everything from meditation to walks along the so-called ‘Compassionate Curve Pathway’; from creative expression (there are art studios in the facility’s Carriage House) to interaction with the facility’s resident cats, Gracie and Tasha, or the small family of chickens now residing there. But, as the name suggests, Genesis is much more than a retreat, where one can sabbatical for several days or several months. It is also a conference center that has hosted groups of various sizes and purposes, including a number of area nonprofits for meetings that last a few hours or a few days. Overall, Genesis has been a place of hope and healing for those who have found it, said Walz, adding that one of its goals moving forward is to increase the size of that constituency. Indeed, the facility has recently started marketing itself more aggressively, said Walz, noting that it is also working to establish more and stronger relationships with area healthcare providers, with the goal of increasing visitation and revenues. For this issue, BusinessWest paid a visit to Genesis to learn more about this mission of helping people ‘get still,’ and how the facility’s staff carries that out. Tracing the history of Genesis, Walz said the property was originally home to one of the owners of the Crane Brothers Paper facility, which operated just a few blocks away on the Little River. The site eventually became home to the Holy Child Guild, administered by the Sisters of Providence from 1933 to 1975, when work was initiated to convert the property into a spiritual life and conference center, which formally opened a year later. In 1990, the 7,000-square-foot carriage house, circa 1899, underwent extensive renovations, and today includes meeting and convention facilities on the first floor and an art space, a small ecology library, and a meditation room on the second floor. And while there has always been a need for its services and environment, they are seemingly in greater demand given recent societal and economic trends and developments. Indeed, workplace-induced stress has been mounting, she explained, noting that many individuals are being asked or told to work longer and harder as their employers, still coping with the aftereffects of the Great Recession, try to do more with fewer people. Meanwhile, the economy has also taken its toll on individuals, producing varying levels of stress. To help people put this stress on the shelf for at least a while and give individuals methods to keep it at bay, Genesis provides a quiet, restful environment that certainly wouldn’t be confused with a five-star resort in the Berkshires or a cruise ship — as reflected in the rates: generally $68 per night, which includes three meals — but provides guests with what they need. There are 30 guest rooms on site, most of them small and simple (the walls are cinderblock), individualized with art created by guests, and without a television set, said Walz, adding that people don’t come here to watch American Idol. (There are a few sets in the lounges if one really needs to tune in to something). They do come to focus and reflect, and they can accomplish this in a number of ways, including meditation, reading, artistic expression, massage, Reiki, time with the cats or chickens, gardening, and more. There is also the Compassionate Curve Pathway, a walkway that winds through the property’s 19 acres. Along the way are markers with reflective questions. “There are so many ways that people can tap into nature as inspiration,” said Walz. And while there are what would be considered organized activities at Genesis, more of the stress-reduction work is self-directed. “When we design programs, we really try to leave a leave a lot of space,” she explained, “so we can offer people a gem for reflection or a question or thought, but really leave it to the individual to dig down. People come to Genesis for different reasons and at different (often difficult) times in their lives, such as after the death of a loved one or during or after a divorce, she continued, noting that most of the guests are women. “We’ve had women who have been in leadership positions in their organizations, some of whom come at a turning point, when that role is completed, when they’re retiring, for example, and closing down that chapter,” Walz explained. “Others just come to have a break; they’re going to go back to that role and those same responsibilities and economic challenges. 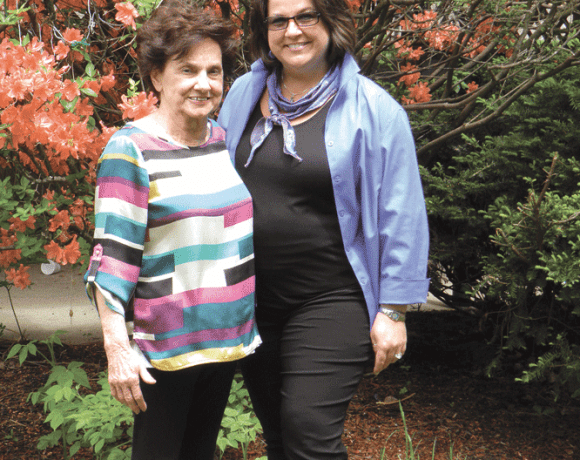 As the Boston Marathon bombing story unfolded last month, she told BusinessWest, some people who had lost loved ones years before realized they had some unresolved grief, and the bombing triggered those thoughts, prompting visits to Genesis for reflection and spiritual guidance. One of the priorities for the center moving forward is to build awareness of its facilities and the many ways it can help guests find that space they’re seeking, said Walz, adding that Genesis is too much of a best-kept secret at the moment. To build awareness of all aspects of the center’s operations, including its ability to host meetings and conventions, the facility has revamped its website and, overall, become more aggressive in its marketing, said Walz, adding that the goal is to achieve continued, controlled growth. Most of the facility’s marketing vehicles feature the Genesis logo, a tree, chosen to reflect the belief that “creation is ongoing and that each person always has the possibility of new beginnings,” said Walz. Creating them generally starts with becoming still, even if it’s just for a few hours or a few days, she went on, adding that, by doing so, people find it much easier to then move forward. Helping people with that assignment has always been the focus at Genesis, she said concluded, adding that this mission is more vital today than ever before. Monastery Heights resident Arlene Welsh relaxes during a Reiki session conducted by practitioner Michelle Noel Plante. A peaceful oasis sits high on a hill in West Springfield, surrounded by 18 acres of grounds that are punctuated by walking paths and a beautiful grotto with a gazebo. For more than 75 years, the historic stone building on the site was home to Passionate priests and brothers, and when a retreat center was added, people who visited Our Lady of Sorrows Monastery found hope and healing there. Today, the well-known property is still a place that tends to the emotional, spiritual, social, and physical well-being of people. However, it has been transformed into a senior-living community known as Landmark at Monastery Heights, which caters to elders at all stages of life, from those in independent-living and assisted-living apartments to individuals in its Morningstar memory-care neighborhood, which offers 24-hour supervision and a full schedule of activities in a secure setting. Residents who live on the independent- and assisted-living floors are housed side by side, which makes it easy for them and their families to add additional care when needed. It also makes moving unnecessary, and no one receiving extra assistance is ever identified as living within a particular unit. But the hallmark of this senior community is the philosophy behind it — a holistic approach to life and the concern paid to the total well-being of each resident, which has been enhanced by a plethora of new offerings this year that range from pet therapy to massage therapy to Reiki. “We’ve added new programs that incorporate people’s mind, body, and spirit as we want to promote optimal well-being and health,” said Marketing Director Mary-Anne DiBlasio. “People want their parents cared for from a medical perspective, but also want them to live in a place where they are loved and respected, and that has a home-like setting. Residents have input into what happens, and as their interests are varied, they are encouraged to attend resident council meetings. 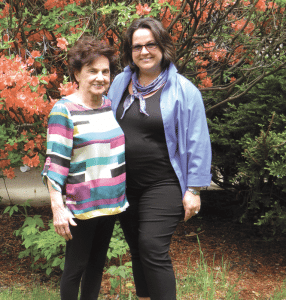 Some have started their own programs, which include cribbage and Scrabble groups, while a close affiliation with the West Springfield Senior Center has allowed others to institute programs there such as a Seder service started by a Jewish resident. “We try to give them as much say as possible,” said Regional Marketing Director Sharon Beaudry, adding that the facility recently met a request to add an extra day to the schedule of the hairdresser who works at Monastery Heights. There is also a lot of interaction with the community, and the Monastery is home to family events as well as programs open to the public, such as a Fall Festival with a farmer’s market on the lawn, which features horse-drawn carriage rides and a vendor fair that includes a booth where Monastery residents sell crafts, photography, and artwork they take pride in. “It really brings out their creativity. The more engaged they become and motivated they are, the higher their level of self-satisfaction and self-worth, which is reflected in better health and wellness,” DiBlasio said. The West Springfield Parks and Recreation Department holds its summer concert series at Monastery Heights, and residents join the public for relaxing evenings on the lawn. “It’s a way to continually keep ties between the community and what is happening here,” Beaudry said. Mary-Anne DiBlasio, right, says developing a strong sense of community is a key to growing a successful facility. 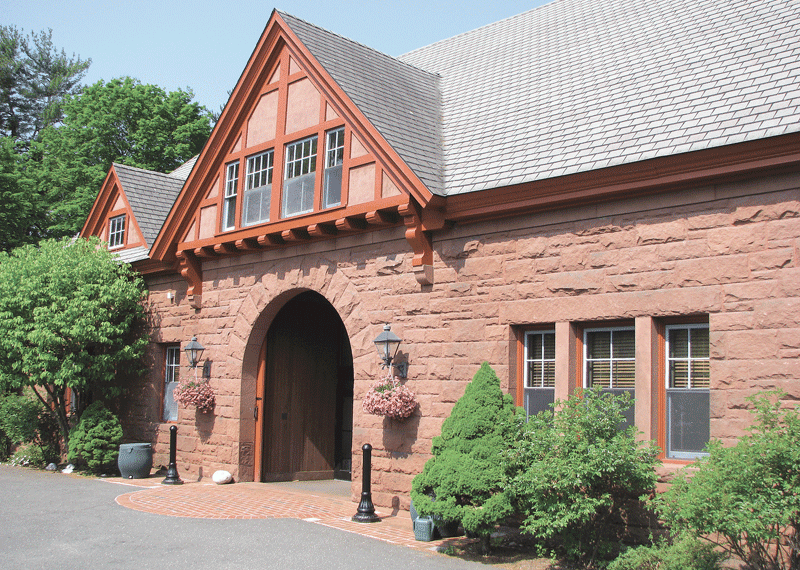 Beaudry said that, when the building’s interior was gutted by developer Simsbury Associates after it purchased the property in 1996, the company took care to maintain its historical charm. “Whenever possible, they left exposed wood and marble as well as the brothers’ chanting chapel,” she said. Thought was also put into what is now the Morningstar neighborhood for people with dementia, which has its own courtyard and garden area. And since the property opened as Landmark at Monastery Heights, elements such as bird feeders have been added outside and benches placed so people can enjoy nature whenever they venture outdoors. But creating a strong sense of community is even more important than the surroundings, DiBlasio noted. “This is a new beginning for people, and we have modified our programs in the last year,” she said as she talked about meditation, reflexology, aromatherapy, and extras added to promote health and relaxation. For example, after each yoga class, a licensed reflexologist gives each (willing) participant a hand massage using essential oils. Art therapy also proves soothing to the spirit, while a wide range of exercise classes that include tai chi, strength training and weekly yoga offer physical benefits. Monastery Heights also boasts a walking club, and many residents, such as DiBlasio’s mother, Rosemarie Fernandes, enjoy walking the grounds. Other physical needs are addressed by three full-time nurses, who are in charge of a range of programs and services that include balance assessments and laboratory and pharmacy services. The former Passionate chapel, with its vaulted, carved ceiling, is a place where peace is almost tangible, and since Monastery Heights is interdenominational, both Catholic masses and Christian services are held there. Residents also enjoy activities and performances at the West Springfield Senior Center, as well as on-site baking classes that people in independent living, assisted living, and the Morningstar neighborhood participate in. “There is no ‘us’ and ‘them’ here, and our residents with memory impairment are always co-mingling,” Beaudry said. However, she noted that the number of people seeking independent-living apartments at Monastery is on the rise. “People come here because they are isolated at home. Even if their children live locally, it is very difficult for them to manage their care, and it doesn’t solve the problem of their isolation,” Beaudry explained, adding that many can no longer drive. A podiatrist visits the facility, and physical and occupational therapy are also administered on site, due to collaboration with a local agency. In addition, everyone who moves in is given a free physical evaluation to determine special needs, such as a raised toilet seat or having fluorescent tape put at the edge of a shower stall and grab bars to help those with poor vision. Monastery Heights has its own store, which is stocked with items residents tend to run out of. “We want to be able to accommodate people and maximize their stay. This is their home, and we want to make sure they are completely happy. We always think about them as if they were our own mom or dad,” Beaudry said. And there are two resident cats, as research shows that pets improve the overall quality of life. Residents can also bring their own small dogs to live there. “Studies have shown that having pets around brings health and happiness to people,” DiBlasio said, adding that the facility recently hosted a dog show. When residents in this area of the building — or any other — are experiencing anxiety, which can occur for people with dementia at sundown, specially trained staff members are able to give them hand massages or administer Reiki. In addition, Monastery staff members work with the Alzheimer’s Assoc. to determine the best way to engage residents in meaningful activities and help them express their feelings, since their verbal capacity is diminished. 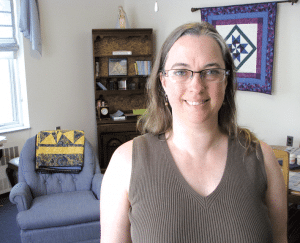 Beaudry said the facility has adopted the association’s ‘Memories in the Making’ program, which uses artwork ranging from drawing to sculpture and cutting paper, then organizing it, as a creative outlet. “We frame their art and put it on display once a year. It makes the residents feel proud and very special,” she told BusinessWest. There are also monthly outings to places such as vegetable stands or to take a cruise on the Connecticut River, as well as weekly trips to get ice cream. For example, a special area was set up for a man who enjoyed workworking, while those who loved to garden can do so in the Morningstar courtyard. Some residents help set the tables for meals, while others enjoy folding laundry. Thought is also given to the menu. “Research shows that diet is extremely important to the body and mind, so we work with nutritionists to create food that is reminiscent of what our residents grew up with, and we use organic, local vegetables whenever possible,” she noted. DiBlasio said the facility’s low vacancy rate is the result of a community-based, comprehensive approach to senior living. “Our success comes from the respect and friendship we earn from our residents. Which is, indeed, a truly holistic approach.